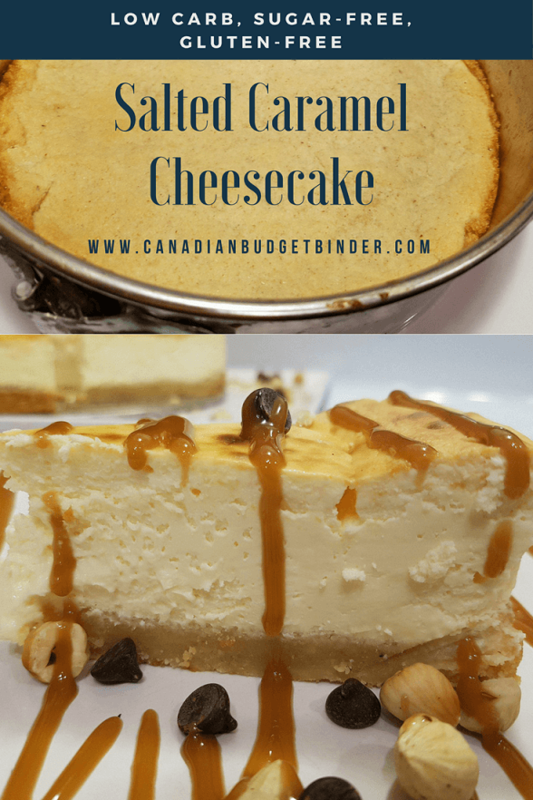 MAKING THE BEST HOMEMADE CHEESECAKE IS EASIER THAN YOU THINK-SAVE YOUR MONEY AND DO IT MY WAY! 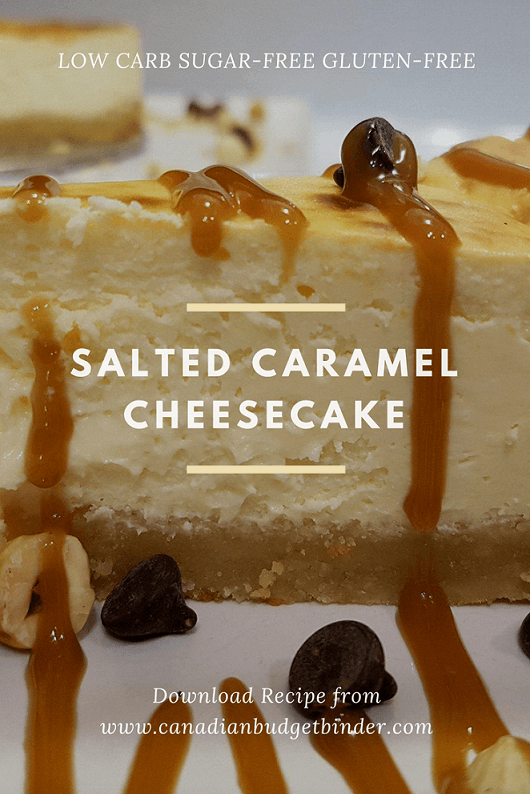 A couple who are friends of ours absolutely adore cheesecake so when we invited them over for dessert last week we thought we’d surprise them with this decadent low carb, sugar-free Salted Caramel Cheesecake. Oh yes, they were surprised! If you can carry out those two aspects of a cheesecake you’ve got yourself a winner. I’m actually quite amazed at how many people think cheesecake is a difficult recipe. That is far from the truth. When we created our salted caramel cheesecake we wanted to keep it simple so our guests could add any variation of toppings we offered. What I like about toppings and cheesecake is that you can add just about anything. Since the CBB house has went low carb and sugar-free just about everything we make takes that path. It has been 2 years since Mrs. CBB gave up sugar and she feels great and doesn’t crave it like she used to. For this recipe I toasted some hazelnuts and had a bag of Sugar Free Dark Chocolate Chips on hand for toppings along with a bottle of Smucker’s No Sugar Added Caramel Sundae Syrup . You can find this at any grocery store in the ice-cream aisle for just under $4.00 or you can order it on Amazon Canada for about the same. You must check this caramel sauce out!! Homemade Sugar-Free Caramel Sauce over at one of my favourite Low Carb bloggers Low Carb Maven only has 1 Net Carb per serving or you can buy sugar-free caramel sauce at the shop. By the end of our evening we had less than half of the salted caramel cheesecake left and our friend asking for the recipe. Mrs. CBB said that our salted caramel cheesecake recipe was a secret jokingly and offered to help her learn how to make it. She is one of those shoppers who would rather buy a cheesecake than make it but trust me it is SO EASY. 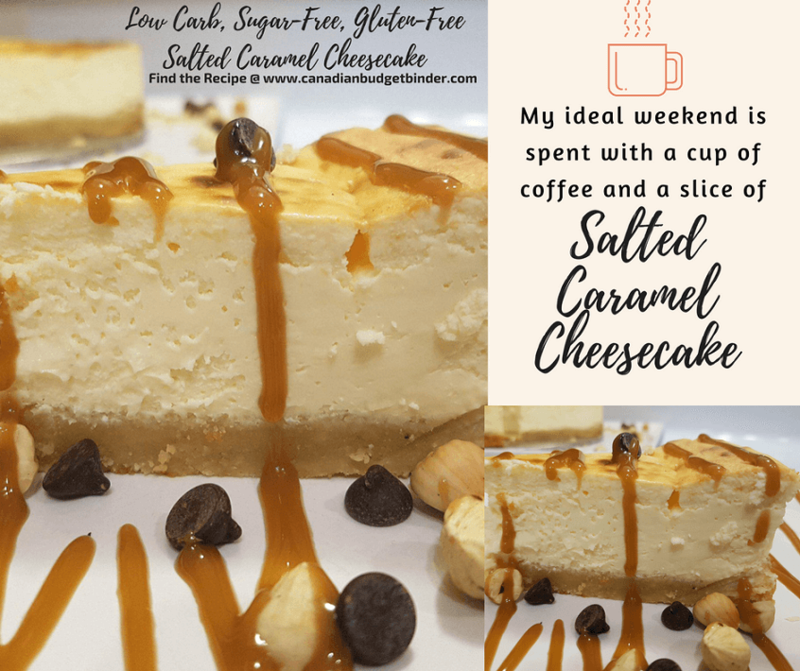 Save the $30-$40 plus it will cost you to buy this salted caramel cheesecake and make it yourself. The salted caramel cheesecake recipe only came about after Mrs. CBB and I said that we wanted a cheesecake that didn’t have fruit on top. Typically if we were to make a cheesecake we’d top it with cherries, blueberries or even our sugar-free rhubarb strawberry chia jam. Although delicious sometimes it’s nice to switch it up and go the gooey route. If you’re not a fan of the Torani Sugar Free Salted Caramel Syrup w/ Splenda, 750 mL when you are making the cheesecake filling simply add an extra 1/4 cup of Swerve confectioners sugar in its place. What you will end up with is a vanilla cheesecake ready for any topping you fancy. Even if you aren’t a sugar-free, low-carb person like I am I still eat it because it is SO GOOD. You can play around with the toppings if you’re not overly worried about adding a bit of sugar. I for instance added homemade caramel sauce that had brown sugar and semi-sweet chocolate chips. Mrs. CBB mentioned something under her breath about not touching her $8.99 bag of sugar-free chocolate chips or I was sleeping outside for the rest of the Fall season. That price is steep for chocolate chips but we found a recipe for homemade sugar-free chocolate chips that we plan to test instead of paying crazy expensive prices online. If you’re not a fan of toasted hazelnuts feel free to add any nut you like if you aren’t worried about excess carbs. We typically have hazelnuts, toasted almonds, crushed peanuts or pecans on hand for such occasions. 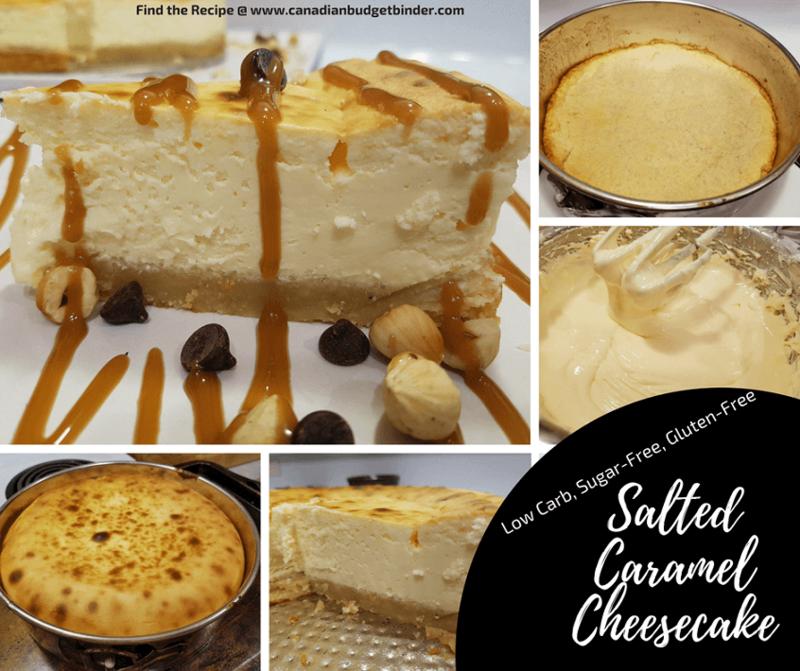 What you might like about this salted caramel cheesecake besides the fact that it is sugar-free and low-carb is that it is gluten-free. The base for the salted caramel cheesecake is a simple almond flour mixture with melted butter and sugar substitute. We baked it for about 10 minutes at 350 degrees until noticed it browning. Any time you bake cookies or even an almond crust like this which is essentially a giant almond cookie I like to under-bake because it continues to bake while sitting in a hot pan or baking sheet. I added a dash of almond extract to the almond crust base although I didn’t know what it would taste like. I was happy I did as everyone complimented me on the flavour of the crust (phew). You never know when you create recipes how they will turn out when you add new or unusual flavour combinations. One major tip I’d give to you when making this salted caramel cheesecake is to make sure you grease your spring-form pan nicely or line it with parchment. The almond crust tends to be moist when baked and needs at least a solid 30 minutes after coming from the refrigerator to slice it without cracking it or having it slide off the cake. I know this because the first 3 slices I did were a bummer because I lost the crust on them. Take your time when slicing and slide a stainless steel spatula under the crust to pull out a slice. This Salted Caramel Cheesecake is loaded with flavour then topped with sugar-free caramel sauce, sugar-free chocolate chips and toasted hazelnuts. Toppings for cheesecake are endless. 1 cup Swerve confectioners sugar or 1¼ cup if not using salted caramel syrup. In a large bowl mix all the Almond Crust ingredients until combined. In a bowl add your cream cheese and mix until creamy, add your eggs one at a time and mix. Add your sugar, lemon juice, vanilla extract, Torani Sugar-Free Syrup or extra ¼ cup Swerve confectioners sugar. Mix with mixer until creamy and fluffy. This could take a few minutes but worth the effort. Put on a baking sheet and bake in the centre oven for 1 hour or until the top is bubbly and browned as in my photos. Remove from oven and run a knife around the cheesecake then let cool on the counter. Put in the refrigerator for 12 hours to chill covered with plastic wrap. Once you have your beautiful slice of salted caramel cheesecake on a plate get the kettle boiling and enjoy a cuppa tea or coffee to go with your slice of heaven. Discussion: What are your favourite cheesecake toppings? Per entire Recipe 14 slices: (this only includes cheesecake no toppings) 29.4 g Carbs or 2.1= Net Carbs per slice. This sounds very delicious! I will have to try. Why Swerve instead of Splenda or the like? I have never heard of this brand. You can use Splenda yes.